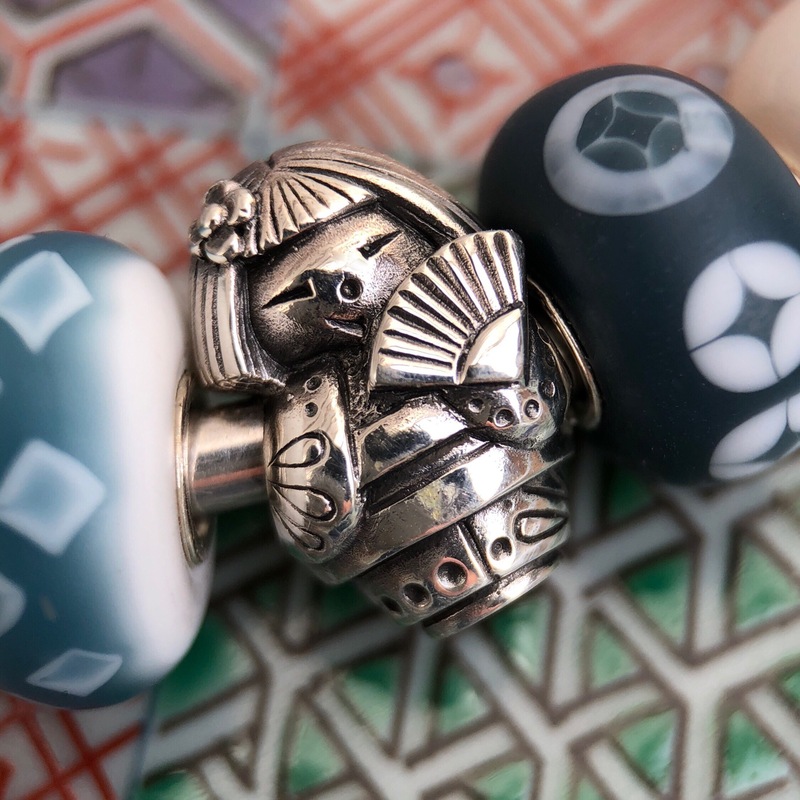 Today sees the release of the latest Kokeshi bead by German retailer Star Bijou, as their line of Spiritbeads continues to expand. Called Kokeshi’s Fan and limited to 1000 pieces, she costs €48 (40.33 without the VAT). I just adore the flower in her hair and her sweet smile, partially hidden behind the fan. I also like her haircut, as witnessed from the back of the bead. 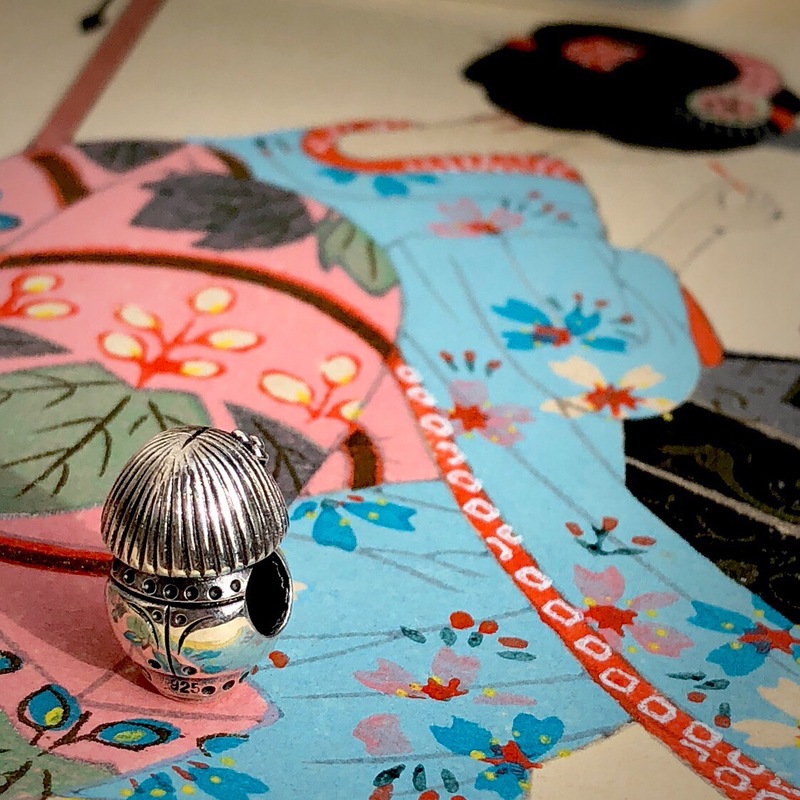 The details on her Kimono are lovely and she will fit on bracelets such as Pandora or Trollbeads. 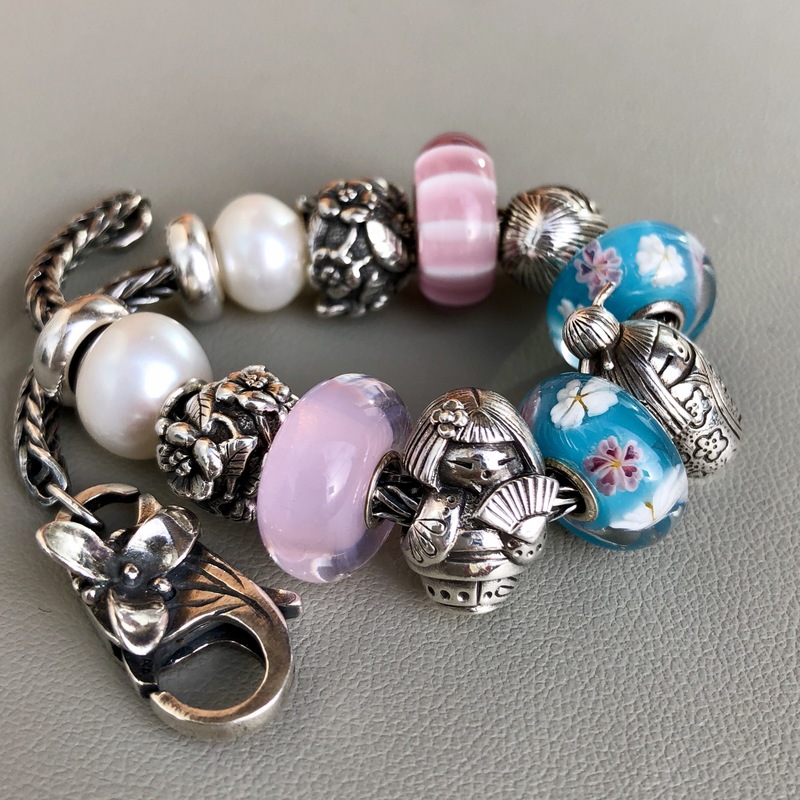 Below, I’ve got her on a Trollbeads bangle but with a couple of Pandora Petite Facets and the Pink Cherry Blossom Murano. The silver Sakura beads are also Spiritbeads and then the white bead is a Trollbead called the Diamond Bead, White. Here is Kokeshi’s Fan with two of her sisters, Kokeshi LE and Kokeshi 2.0 and a couple of glass beads from the German artist Melanie Moertel. Lastly, here’s a larger bracelet with some Japanese inspired glass. 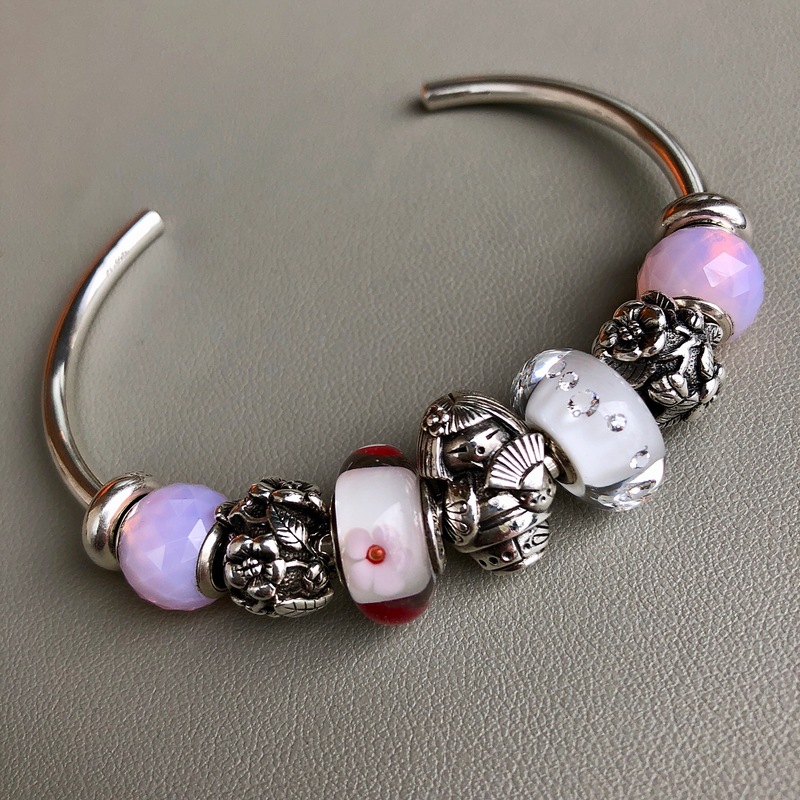 The blue beads are Trollbeads’ Blooming Sakuras, the pink bead in front is called Baby Girl and the back pink bead is a unique. I hope you’ve enjoyed this look at the delightful Kokeshi’s Fan. At 1000 pieces there should be enough for all those who want one, but it does seem like Spiritbeads are becoming more and more popular! 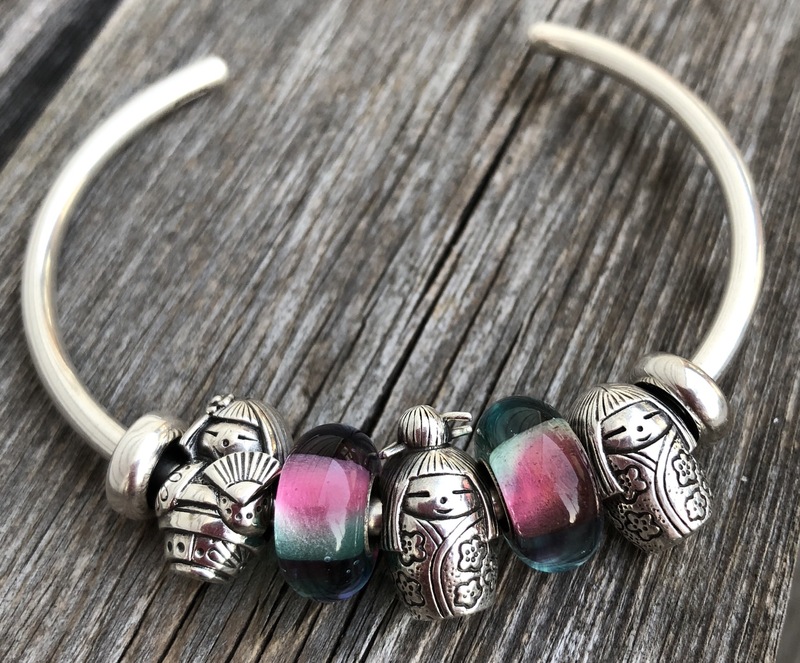 You can click on the Spiritbeads tag to see more combos with their beads. They certainly are a decent price for something handmade in Germany. I recently bought a Round Endless Knot bead so I’d have a pair and it was very easy to order online and was here in about a week. 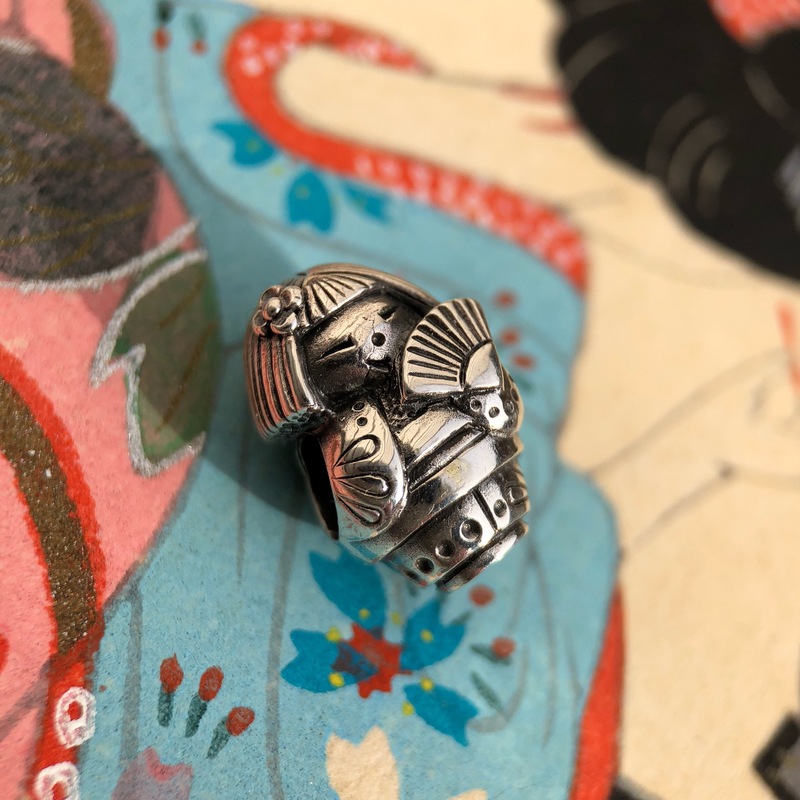 Do let me know if Kokeshi’s Fan is on ‘the list’ or if there are other Spiritbeads you’d like! She looks adorable! The details in her outfit are amazing. Her expression almost appears coquettish behind her fan. I enjoyed watching the making of the Spirit Beads video on their Instagram. I really love this whole line of Kokeshi dolls. They have such sweet faces, which is not always the case with beads! Yes, behind the scenes videos are always so interesting to see! I adore these..they look like tiny dolls. I agree. They are so nicely done! Hi Martha! They certainly do Asian-inspired beads very well! 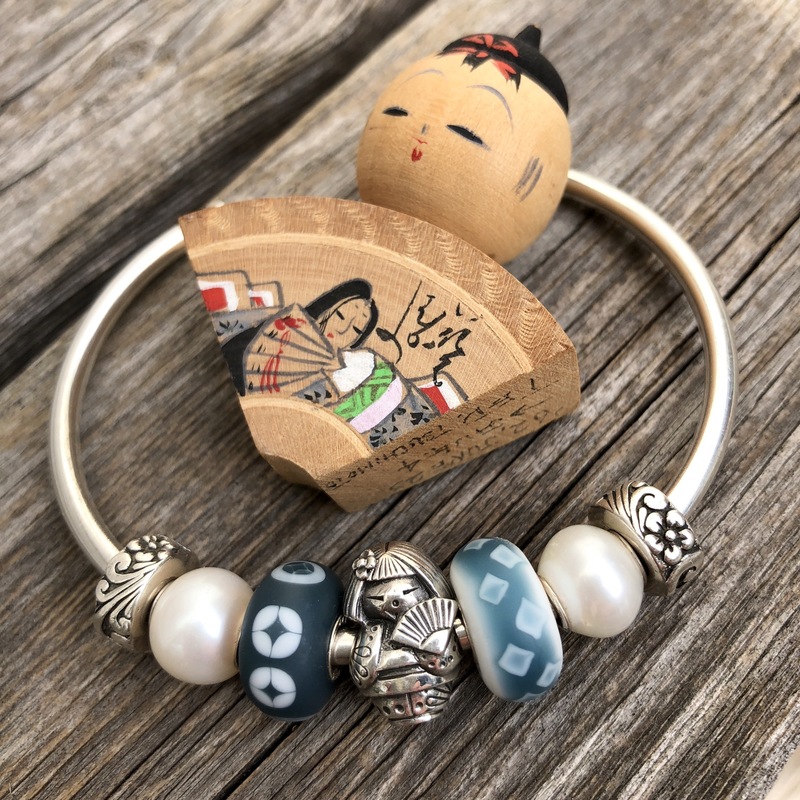 I have to say that your bangle with the three Kokeshi dolls and Melanie Moertel’s glass beads ( which I love, by the way!) is my favorite. I’ll be waiting! I’m especially eager to see the Redbalifrog collection, they never disappoint! No, sorry! They are very popular and unfortunately sell out quickly.